Amy Schwartz Moretti joined the Mercer University Townsend School of Music in 2007 as director of the Robert McDuffie Center for Strings where she teaches violin and holds the Caroline Paul King Chair in Strings. Recognized as a deeply expressive artist with an affinity for chamber music, she has a musical career of broad versatility.She came to Georgia following eight years as concertmaster, first with The Florida Orchestra, then the Oregon Symphony. Performing internationally, especially chamber music, she appears at summer music festivals and in artist series across North America and Europe.A frequent guest at ChamberFest Cleveland and the Bridgehampton, Fayetteville, Rome (Italy) and Seattle chamber music festivals, her professional performances also include recent concerts at London's Wigmore Hall, Kamermuziekserie Souvenir in Tilburg, Netherlands and Musée du Louvre in Paris. With James Ehnes, Richard O'Neill and Robert deMaine, she is a member of the acclaimed Ehnes Quartet. They recently contributed two Shostakovich quartets to the recording Khachaturian/Shostakovich (Onyx Classics) that was selected "Album of the Week" by London's Sunday Times, June 6, 2014. Recent recording projects also include Prokofiev and Bartók duos with James Ehnes. Their rendition of Prokofiev's Sonata for Two Violins was lauded as "electrifying" by The Telegraph (UK) and included in Prokofiev: Complete Works for Violin (Chandos) that won the 2014 Juno Award for Classical Album of the Year. 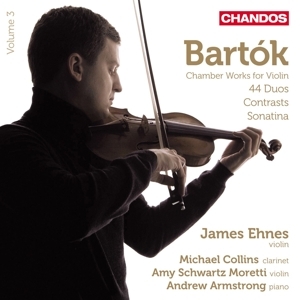 Chandos released their 44 Bartók duos February 2014. With Richard Yongjae O'Neill and Ani Aznavoorian, she recorded a newly commissioned String Trio (Harmonia Mundi) by John Harbison, and with Ricardo Morales and Anna Polonsky, she made a live recording of Ives' Largo for Violin, Clarinet & Piano (Onyx Classics), both scheduled for release, autumn 2014. Ms. Moretti has given the premiere of works by Kevin Puts, Adam Neiman, Gary Kulesha, Libby Larsen and Mark Sforzini, and in 2014-15 will premiere Grammy Award-winner Matt Catingub's concerto written for her: Three Shades of Blue for Violin, Jazz Trio and Orchestra. Her 2014-15 engagements also include the Ontario debut of the Ehnes Quartet at Bravo Niagara! and concerts in San Francisco, Detroit, Miami, Charleston, and Seattle. Dedication to collaboration and performance inspires Ms. Moretti's teaching. She was instrumental in the development of intensive summer chamber music workshops for young musicians in both Florida and Oregon. At Mercer, she teaches the Center's violin students, coaches chamber music, leads the MCS Ensemble and directs the Labor Day Festival. A frequent performer on campus, she curates the Fabian Concert Series and is violinist of Cortona Trio with her colleagues cellist Julie Albers and pianist Elizabeth Pridgen. Prizewinner in the D'Angelo International Young Artist Competition for Strings and Award winner at the Washington International, she made her recital debut at the San Miguel de Allende International Chamber Music Festival as violin winner of the Irving M. Klein InternationalString Competition. She was mentored by Isaac Stern at his prestigious Chamber Music Workshop in Carnegie Hall and twice awarded fellowships from the Aspen Center for Advanced Quartet Studies where she was coached by some of the finest chamber musicians of our time. Her New York solo concerto debut was in Carnegie Hall. She has made guest concertmaster appearances with the Atlanta Symphony Orchestra and the New York Pops as well as CityMusic Cleveland, a chamber orchestra bringing free concerts into the neighborhoods of northeastern Ohio, and the festival orchestras of Brevard, Colorado and Grand Teton. Born in Wisconsin, raised in North Carolina and California, Ms. Moretti is the third generation of professional musicians in her family. She and her husband reside in Georgia with their two young sons. Her degrees are from the Cleveland Institute of Music where she graduated valedictorian, a student of Donald Weilerstein.Major teachers also include Zaven Melikian, Peter Salaff, Margaret Pardee, Joanne Bath and the Cavani String Quartet. The Cleveland Institute recognized her with an Alumni Achievement Award, and the San Francisco Conservatory of Music celebrated her as their 2014 Fanfare Honoree. Through the generous efforts of the Stradivari Society in Chicago, Ms. Moretti has been awarded extended use of an outstanding Italian instrument, the 1744, G.B. Guadagnini violin known as the "Canadian."